The well water test came back with questionable news about the water. The stains in the plumbing already indicated rust and lime (calcium carbonate) in the water and the new boiler/water heater requires that the water not be high in either. But the water test showed unacceptable levels of Manganese as well as high level of iron. (.05 ppm of Mg and .2 ppm of iron) The ph is 8.4 and the total dissolved solids super high at 850. The TDS seems to be the result of high levels of calcium carbonate (99 ppm) and other salts. The test also returned high levels of lead, sodium, and sulfate (lead .011 ppm, sodium 240 ppm and sulfate 340 ppm)–so not that suited to sensitive plants–especially food plants. Fortunately no radon, coliform or e. coli bacteria though! What do these numbers MEAN? The best information I found regarding water quality and each item on the test list was from the New Hampshire Department of Environmental Services. Each of these factsheets thoroughly discusses the impact and issues regarding the water test results and possible treatments. Generally for high levels of hardness (130) a water softener system is utilized exchanging the calcium carbonate and other minerals for sodium. Softened water is not recommended for drinking purposes, but our water also is high in sodium so a sodium system is a questionable remedy. I researched several forums and websites that advertised water treatment systems and found a couple of vendors that had good reputations online. After researching the different media that is available to treat water, I decided the first thing was to get the water reasonably able to be used by the boiler and water heater. This meant reducing the levels of iron and manganese and doing something about the hardness–calcium carbonate. Water is treated for iron with a greensand or birm filter. But these media have been superseded by new treatment media such as Filox and Mang-Ox. The latter media seemed to be the most recent and best due to its solid composition and long life. It is manufactured by Noble House Group. The online filter store, Clean Water Systems, (now Clean Water Store, is an online vendor for a system with this media and they were often recommended in various water issue forums. UPDATE: This vender has replaced the MangOx filter with a ProOx filter. This filter will reduce the rust in the water but will not help with the lime and hardness. For that I decided to try an inexpensive electronic filter that is supposed to keep the calcium carbonate in suspension thus alleviating the deposits on pipes and fixtures. Some water companies especially pooh pooh this method but there is some evidence that it works as I heard from a fellow boiler classmate and from the New Hampshire information sheets. The Clearwave CW-125 Salt Free Electronic Water Conditioner from Amazon for $129 and hope that it will prevent scale buildup on the boiler. 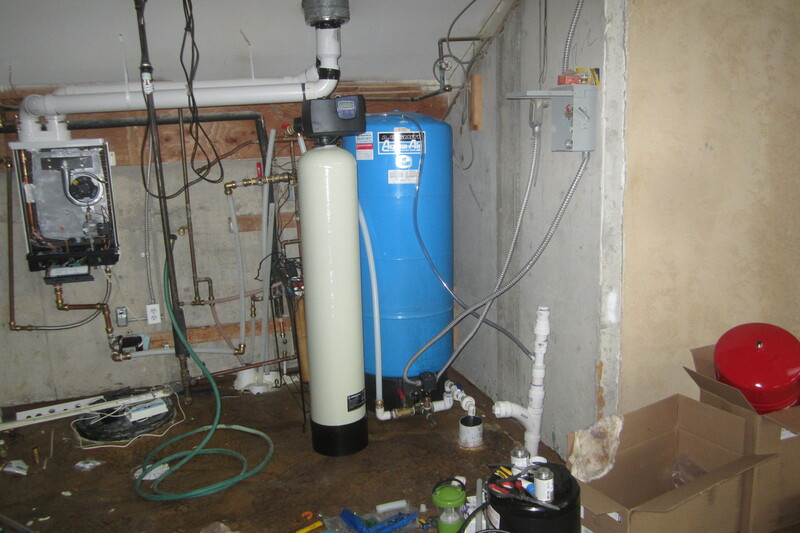 Otherwise the installation of the filter took time and research, but it was relatively easy. The pressure tank also had to be reinstalled and I had to change both the leaking drain spigot and the ball valve because I could not get the reducing coupling out of the old one. The valve is 1 1/4 inch and the water supply I was using is 1″ so there was still a brass reducer. I kept everything lead free and brass, copper, or pex in the system. But there still seems to be one galvanized pipe that comes out of the pressure tank. The Mang-Ox media came in three bags, packed separately, and the filter has gravel at the bottom. The Vortech tank has a central pipe and bottom screen that allow for better backflushing and the meter that the company recommended is the Fleck 7000STX, which I bought with an internal flow meter so that the system would backflush based on gallons used rather than time past–this is because we are not moved into the house yet. Also it will tell us how much water we are using which is a LEED recommendation. I had one issue with the meter setup–well two, I broke one of the washers for the rear slip in pipe connection but luckily had one that fit available from a broken union valve. I also could not get the buttons to respond to touch and thought the whole meter was broken, but a call to the company had me remove the cover and press the buttons directly and they worked fine. Apparently the touch controls on the cover can become misaligned in shipping. They aligned properly when I reinstalled the cover. There is a formula for setting the hardness and the system capacity that results in the number of gallons between backflushes. The ratio is never really spelled out in the directions and neither is the fact that the number of gallons flashes with the time after setup so that is where you find out the result of the formula. I set the system for a capacity of 60 and a hardness of 100 to get a 600 gallon backflush interval. That was recommended by the vendor rep who was quite good at answering ALL of my specific questions by email. He also realized that I had the wrong installation instructions since I purchased the extra backflow tank that will also do a chlorine wash of the media to extend its life. I used 1″ pex and sharkbite fittings for the system install–they make it easy to install and remove the piping if there is an error. The pipe is not very self-supporting though, so I used a 2×4 to hold up the connections between the filter and the drain spigot. I used a plant stand to hold up the after filter which for this system is only 5 micron–I have a ton of 5 micron filters already purchased so they recommend 1 micron but 5 will have to do for awhile. Since the Mang-Ox filter does nothing for the calcium carbonate, hardness, TDS, or salts, I am considering installing a second filter as a carbon pre-filter to remove the chlorine and for a reverse osmosis system. I would route the RO waste water back into the water system to avoid more wasted water (other than the filter backwash water). 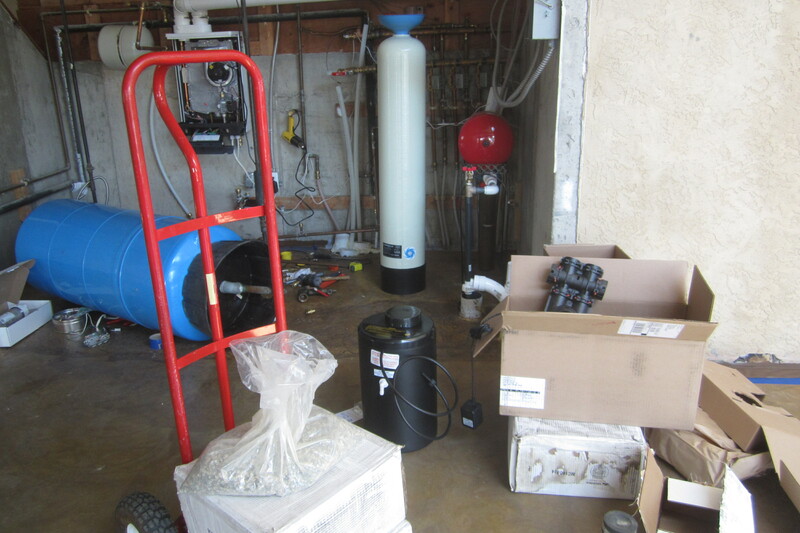 Watts makes an RO system that sends the wasted water to the hot water tank. So I’m thinking of putting together a 1/2″ sized (as opposed to 1/4″) RO piping system that uses a more capable membrane than most residential systems, and trying to use it inline as a whole house system. Since the water pressure is only about 30 psi coming out of the existing system, I am hoping I can use one of the pumps I have already purchased to increase the water pressure to 70 psi at the RO membrane. But I have not yet quite figured out how to control the pump for the instantaneous demand. More research is required! Filter Installed with backwash connected to the utility sink drain. 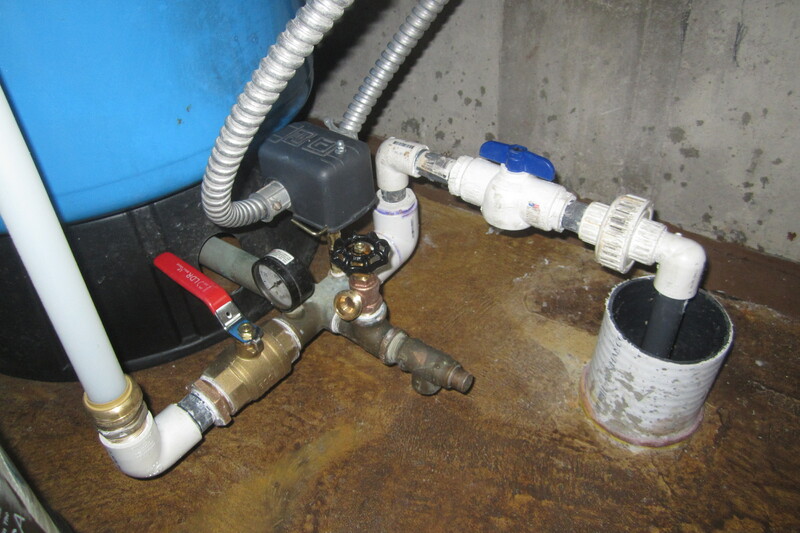 UPDATE: This connection does not meet code–there must be an airgap and trap between the backwash and the drain pipe. The easiest drainage for the backwash is directly into the floor drain with a 1″ gap between the 1/2″ pipe and the drain. This entry was posted in House Systems, Plumbing. Bookmark the permalink.